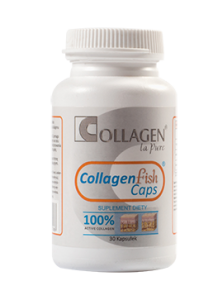 Collagen Fish Caps belong to the innovative series of preparations for anyone who has experienced collagen loss. It is recommended to both sportsmen of various disciplines and convalescents after injuries, who need to regenerate their cartilage tissues, joints and tendons. Collagen Fish Caps are specially recommended to people over 25, during menopause, the elderly and to all those who have experienced collagen loss due to illnesses, injuries, physical effort or excessive exposure to factors degrading collagen, such as ultraviolet radiation, stress or fast pace of life. Recommended daily intake is 2 capsules. Collagen Type-I is the most common collagen type in the human body. It can be found in the skin and the subcutaneous tissue. It also appears in the tissue composing scars, in tendons and connective tissues in bones. Collagen Fish Caps dosed orally in the form of lyophilized I-type collagen and vitamins C and E is an exceptional dietary supplement. It reduces signs of aging, helps the body to keep fit and gives it the sense of well-being; also, it supports post-injury treatment. Collagen Fish Caps is a source of easily assimilated proteins containing peptides which stimulate metabolism in cartilaginous and bone tissues, support their growth and the development of new cells regenerating joint tissues. Unlike the medicines which only alleviate pain, collagen peptides contained in Collagen Fish Caps positively and lastingly affect the structure and mechanical qualities of cartilage, ligaments, tendons, bones and skin. Collagen Fish Caps regenerate and reconstruct nail plates and strengthen hair roots, thus reducing hair loss and brittleness. The bioactive collagen from the capsules rebuilds proteins in all body cells and is a crucial element of bones, tendons and cartilaginous and bone tissue – it is contained in a starch capsule safe even for diabetics. Unlike in tablets, the active substance in capsules is not pressed, but appears in the form of powder (lyophilized powder) coated with a container. The containers (capsules) are made up of starch, which enables the active substance to release itself slowly in intestines. Used for oral administration and enabling the active substance to release itself in different parts of the digestive system, the starch capsule is the best carrier of bioactive collagen, thus making the active substance 10 times more effective. Collagen as Active Substance Fish collagen contained in Collagen Fish Caps most closely resembles the human one and makes our preparation completely transdermal, which means that it can be absorbed by human tissues after a big molecule has been broken down into smaller ones. Based on a triple helix model, the structure of a fish collagen molecule is identical to the shape of a human collagen molecule. Being the elementary protein in the bodies of vertebrates, collagen builds a special scaffolding which cells of particular organs are placed on. The body synthesizes it by itself, but due to illnesses, stress, excessive effort or injuries – when the collagen fibres are degraded at a faster pace – the body may experience a collagen loss. The collagen deficiency is more noticeable with age because its production decreases as we become older. This is especially true from the period of menopause and andropause, when problems with good looks and health start. The collagen used in our preparation is unique on a global scale, maintaining its biological activity. Collagen Fish Caps makes up for collagen deficiency, which results in real improvement of the physical state of a person. The collagen contained in Collagen Fish Caps is a lyophilized powder obtained through the process of freeze-drying, which preserves all the qualities of collagen. We complemented the collagen lyophilized powder with vitamin C in order to enhance its effects. Vitamin C is indispensable in the synthesis of collagen and in the defense of its fibers. It is a strong, effective antioxidant; thus when in sufficient amounts in the body, it protects it from the effects of harmful molecules which destroy tissues. Therefore, vitamin C counteracts aging processes and cancer. It stimulates the immunological system. Also, it is essential for the proper functioning of the vascular system, heart, liver and nervous system, especially during stress. Vitamin C prevents aging process of skin and the body in general; it helps to retain good looks, physical fitness and well-being. Vitamin E is mainly an antioxidant: it protects the body from toxic substances and helps to detoxicate it, reducing the risk of cancer. As one of the “vitamins of young age”, it participates in the synthesis of collagen, thus being necessary for the good-looking skin. Vitamin E counteracts vascular system illnesses, cataract, unpleasant effects of menopause and male infertility. It helps in treating acne, age spots and hair loss.